1.This wristband does not support the heart rate monitor. 2.wristband compatible to the OS Android 4.4 and above, IOS 7.1 and above. Pls check if the phone matchs up the OS before you place a order. 3.The bracelet supports the life waterproof, you can wear it to wash hands, but not put it into the water or take a shower with it. 4.You need connect to the watch via the app and download the app by scanning the QR code, searching the keywords "VeryFitPro" in the google play or Apple Store. 5. 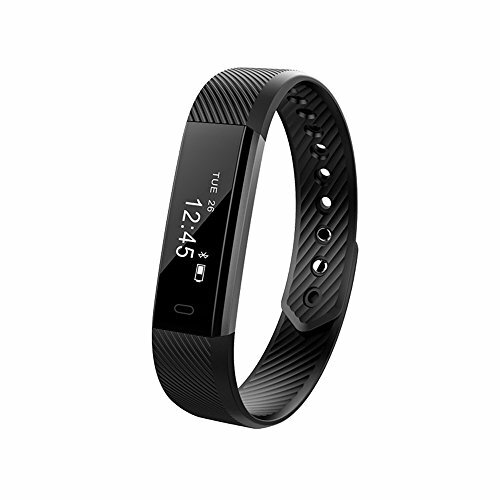 This product is applied with professional Bluetooth RF signal and self developed algorithm, the accuracy of the step pedometer could be up to 95%,but this can not mean that the step is accurate to 100%. Q1: Is this water proof? A1:Water Resistance. wristband is sweat, rain and splash proof. However, the device is not swim proof or shower proof. With any wearable device, it's best for your skin if the band stays dry and clean. Q2:How does it charge? Does it have to plug in or does it charge with charging cable? A2:It can be removed form the band, then plug it into a USB port to charge well. ◆Smart fitness tracker! Use this revolutionary new device to track not only steps taken,but also distance traveled, calories burned and active minutes. You get INSTANT REMINDERS when CALLS or TEXTS are coming in, plus you can activate the Anti Lost feature to get alerted when your Phone becomes too far from the Smart Band. Never risk losing your phone again! ◆ADVANCED BLUETOOTH TECHNOLOGY MAKES YOUR LIFE EASIER ✔ Sync stats wirelessly and automatically to virtually any and every brand/model of Smart Phone. You get to take advantage of Bluetooth making connecting and transferring data to your Phone or mobile device a breeze every time. ◆IMPROVE SLEEP PATTERNS AND HABITS WITHOUT DISTURBING YOUR PARTNER ✔ Monitor how long and well you sleep, and wake only you (not your partner) with a silent alarm. ◆NEW DESIGN, USB interface, directly charging, convenient and quickly.It don't need the charge cable any more when you charge the wristband. ◆TAKE ADVANTAGE OF HELPFUL REMINDERS TO REACH YOUR GOALS QUICKER!! ✔ Set reminders to alert you when you have been sitting or motionless for too long. Take charge of your body today with our industry leading Smart Wristband! You'll get Serious versatility that can even transform your phone into a Remote Shooting Camera using the Smart Band to control the shots! ** Requires iOS 7.1 and above or Android 4.4 and above. This Smart Band Does NOT Work With WINDOWS PHONES. If you have any questions about this product by HuiNiu, contact us by completing and submitting the form below. If you are looking for a specif part number, please include it with your message.